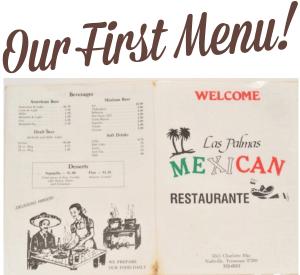 Introducing Las Palmas' New Menu! This new look is almost 30 years in the making with a story many in Nashville can relate to -- having a dream and putting in the hard work to bring it to life. That’s how it all began for the Ayala and Oñate families when they came to Music City to start a new restaurant. With expertise as cooks and restaurant managers in Atlanta, they knew all too well the challenges and risks of building a restaurant from the ground up, but with the last of their savings, they pressed forward and opened Las Palmas on August 20, 1990, passing out flyers, free tacos and sodas to get people in the door. They’ve never looked back and have their loyal customers to thank that they don’t have to! Las Palmas’ original menu did the job of reflecting the fast, fresh and friendly concept that has turned Las Palmas into one of Nashville’s favorite Mexican restaurants. As Las Palmas evolved -- now with nine locations in the Nashville area and over 200 employees -- our look needed to do the same. From day one, our food has been most important: that it be authentic, fresh and of the highest quality. That’s what makes us different ... but presenting it with some impressive plating and mouthwatering photos doesn’t hurt either! Las Palmas' new menu brings old favorites to life with bold pictures that make your mouth water and your mind wander from one delicious menu item to the next. Choose from popular signature dishes like the Chori Pollo, which is topped with a savory blend of grilled choizo, onion, potato and hot melted cheese, or the Nachos Palmas piled high with hot melted cheese, seasoned ground beef, shredded slow-roasted chicken, beans, pico de gallo, lettuce and sour cream. Vegetarian dishes are also on the menu, with options like the Spinach Enchiladas, Burrito Jalisco and Burrito Especial, Quesadilla Rellena, and more to suit any appetite. Our versatile menus include a range of “build your own” options, including street tacos, burritos, nachos, combo plates, and more! We even have a special kids menu for los niños and an extensive beverage menu for adults. 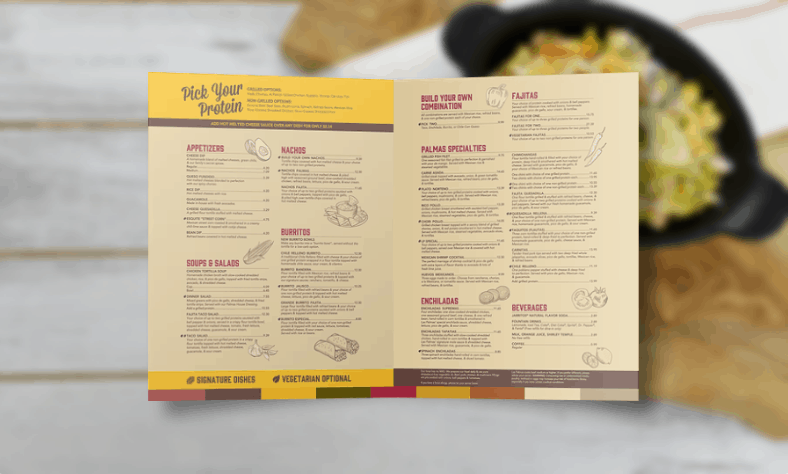 Check out our new menu and join us for your next meal! Welcome to your Family-friendly, locally owned restaurant serving only the best Mexican food made with the freshest ingredients. Come dine with us today. Try our delicious chicken tortilla soup! Homemade chicken broth with slow-cooked shredded chicken, rice, & pico de gallo, topped with fried tortilla strips, avocado, & shredded cheese. ½ Off House Margaritas and Draft Beer from 5-8pm. Not valid with any other offers or discount. Coupon not required. Free cheese dip when you sign up for our e-club! Click here to sign up. Dine in or carry out. One coupon per ticket per visit. Offer available to members of the Las Palmas e-Club only. Offer may be redeemed at any Las Palmas Mexican Restaurante in the greater Nashville metropolitan area. Printed or mobile coupon required at the time of purchase. E-CLUB COUPON REQUIRED. Offer may not be combined with any other offers or discounts. Offer expires end of the day, April 30, 2019. Click here to sign up. 4.15.19, keep more of that tax refund in your bank account and save with All Day Happy Hour. ½ Price House Margaritas & Draft Beer. Dine in only. No coupon required. Offer may be redeemed at any Las Palmas Mexican Restaurante in the greater Nashville metropolitan area. Offer may not be combined with any other offer or discount. Offer valid 4.15.19 only. College students with valid student ID receive 10% off any adult meal and beverage order. Not valid with any other offers or discount. Alcohol and taxes not included. Coupon not required. receive 15% off any adult meal and beverage order. Not valid with any other offers or discount. Alcohol and taxes not included. Students K-7th grade can bring in their report card with all A’s and B’s and receive a free ‘kid’s’ meal with the purchase of any adult meal. Simply show the report card to your server. Dine in only. Offer may not be combined with any other offers or discounts. Coupon not required. 4.7.19, 25% Off Burritos ALL DAY. Happy Hour from 5-8pm. Dine in only. No coupon required. Offer may be redeemed at any Las Palmas Mexican Restaurante in the greater Nashville metropolitan area. Burrito and happy hour offer may not be combined with any other offer or discount other than 25% off burritos and happy hour on 4.7.19. Offer valid 4.7.19 only. All our friends, 60+ years young receive 15% off any adult meal and beverage order. Not valid with any other offers or discount. Alcohol and taxes not included. Coupon not required.